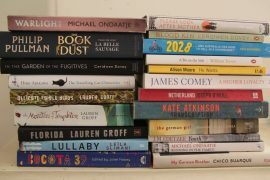 The GDP60,000 prize, which is awarded every second year to a living author who has published fiction either originally in English or whose work is generally available in translation in the English language. It is for a writer’s body of work rather than a single novel. The winner will be announced on 19th May. Previous winners are: Lydia Davis in 2013, Philip Roth in 2011, Alice Munro in 2009, Chinua Achebe in 2007 and Ismail Kadaré who won the inaugural prize in 2005.